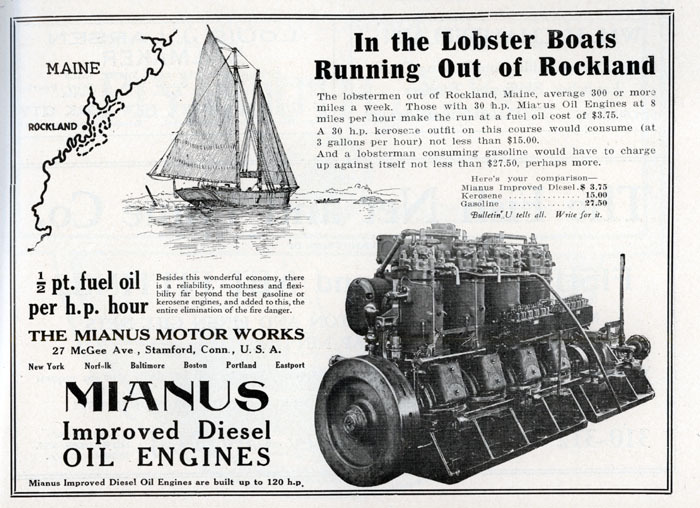 Atlantic Fisherman magazine advertisement for Mianus diesel oil engines. Diesel engines became more popular for larger fishing vessels because of their fuel efficiency and simplicity. They were being installed into sail powered offshore fishing vessels by the 1920s, first as auxiliaries to sails. Then sails became auxiliaries to engines, and finally, as more vessels turned from dory fishing to trawling, sails disappeared. 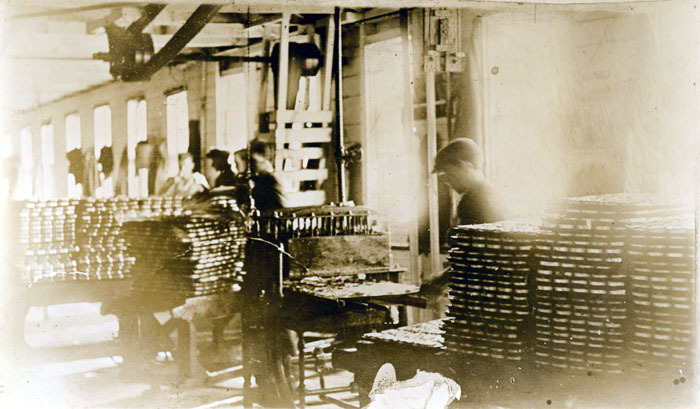 Sardine packing became highly mechanized with companies in Eastport making special machinery for packing and producing tins. This shows the inside of a sardine factory, about 1920, with a hand oil filler; these were superseded by automatic fillers. The sardine cans were filled with oil before being closed and cooked. 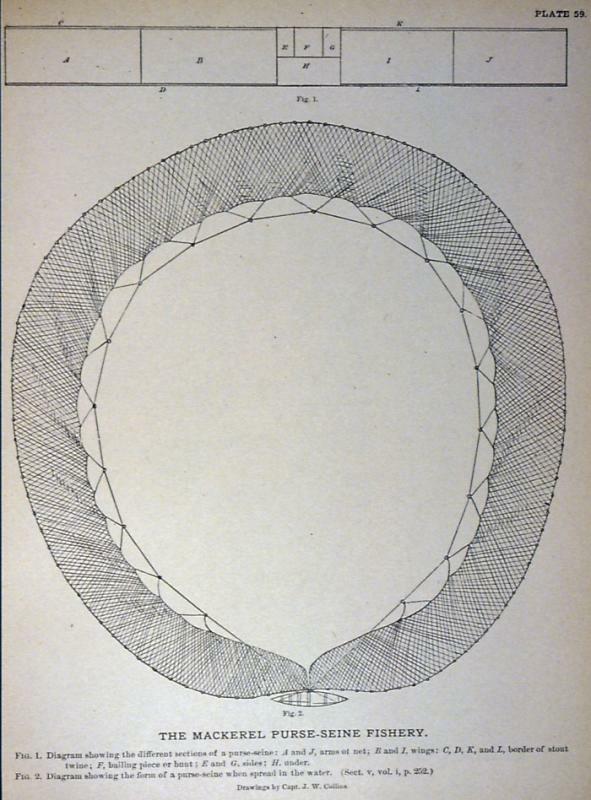 When this photograph was taken, machinery took power from belt drives coming from one large engine. This photograph is from the Atlantic Fisherman collection. 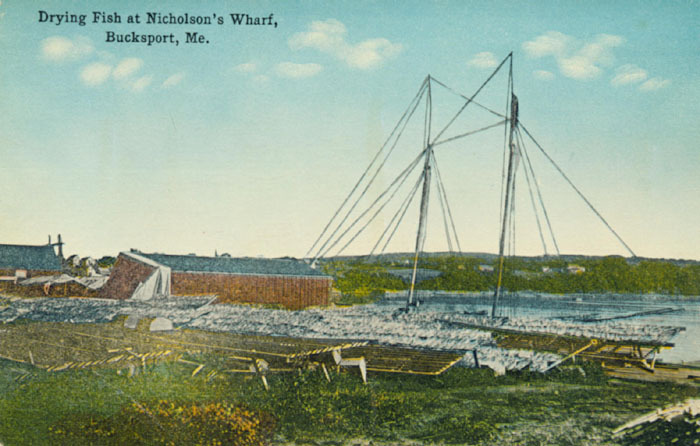 Summer visitors to Bucksport could buy this postcard showing fish drying at Nicholson's Wharf, Bucksport, Maine. Thomas Nicholson was one of Maine's last Grand Banks cod fishing schooner owners. By the time of this postcard, this was a rare sight. After processing, cod were salted and dried on fish flakes. Once dry, the fish were packaged for shipment. Dried salted cod could keep for well over a year. 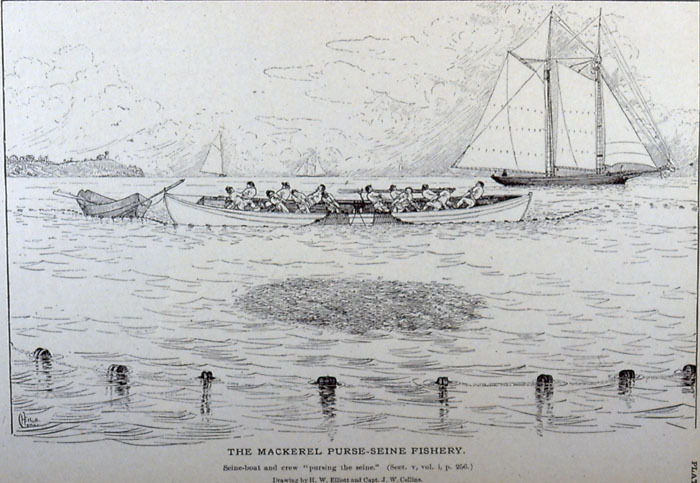 A schooner loads herring from a small boat alongside, salting down the fish as it goes into the hold. 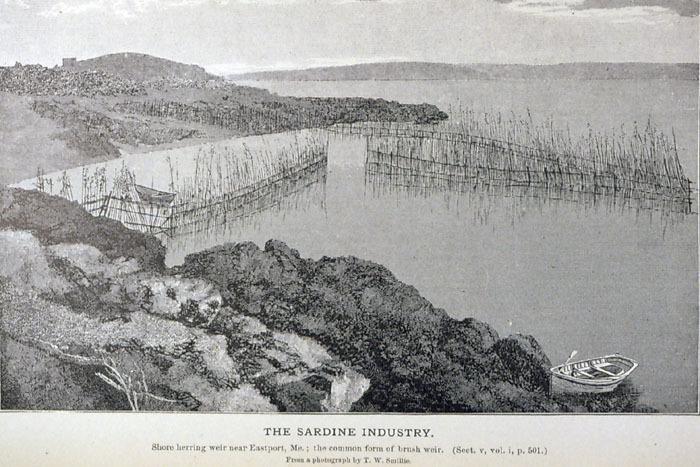 The fishermen are standing thigh deep in fish presumably caught in the weir to the left rear of the photograph. 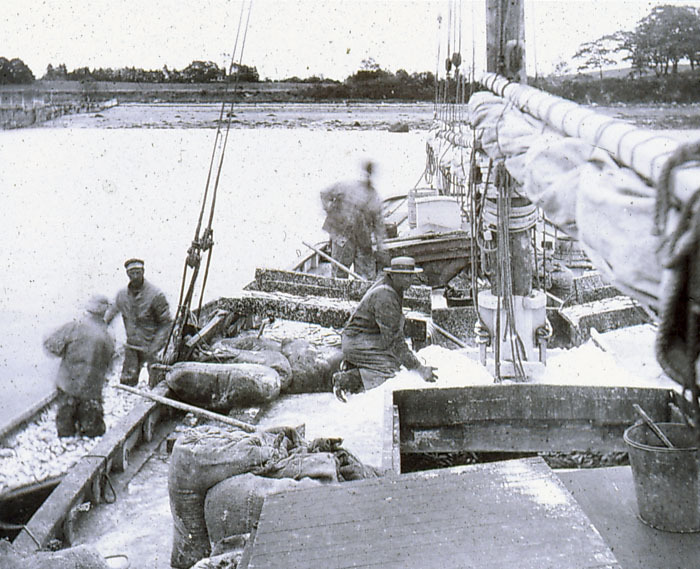 Bagged salt is spread on the deck where it can be shoveled into the hold with layers of fish. 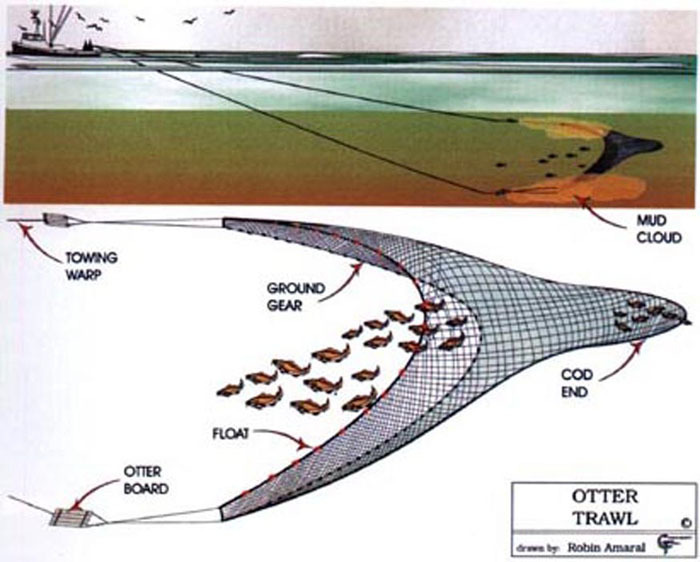 A chute lets the fish be easily shoveled over the schooner's rail. 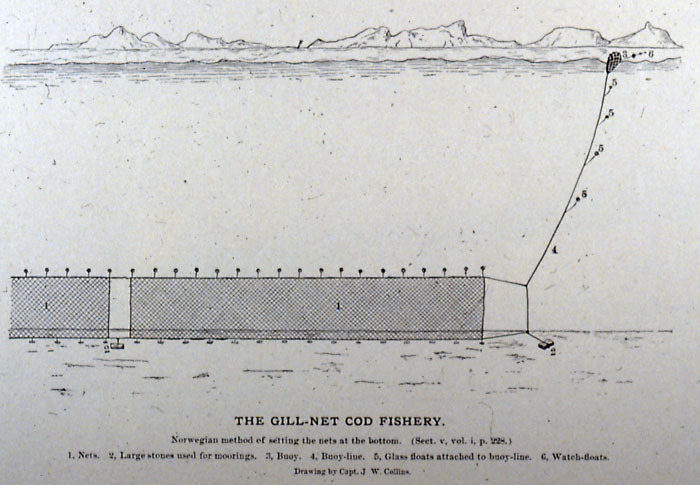 Salt was a large portion of fishing expense in the days before ice plants and gasoline and diesel engines, which made fresh fishing possible. But herring were always salted as they were headed for the cannery. The Atlantic Fisherman, a magazine for the fisheries business, got underway in 1921. 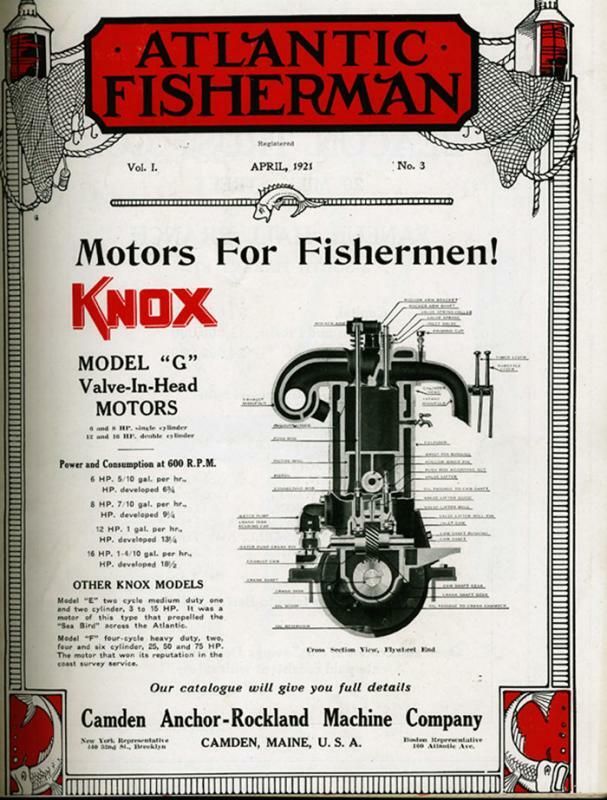 Its third issue had this cover with this large advertisement for Knox Model G Valve-in-Head Motors. Starting from small two-stroke engines in 1901-2, Camden Anchor-Rockland Machine Company of Camden, Maine progressed into making larger engines, and also began to build engine powered boats.